This tiny house was the original dwelling on the property and has been renovated to give it a new lease of life. Corner stone Roots recorded one of their 3 albums here so bit of nostalgia for the muso's. 2km to the world famous left hand breaks and 1km to the main beach (Ngaranui). The main beach can be walked to from the shack as well as many other bush tracks to explore. 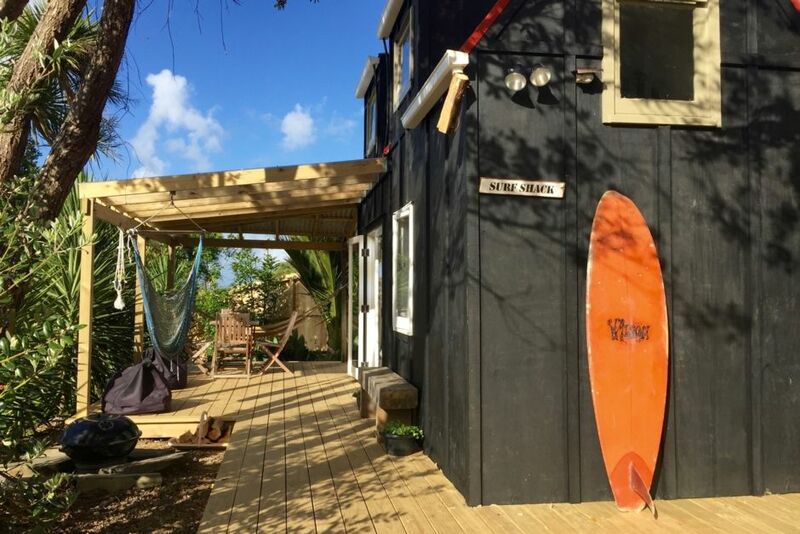 The shack is cosy, comfy and relaxing and only 5km to Raglan Town centre where you can wine and dine and explore the unique shopping Raglan has to offer. It's a colourful vibrant west coast town where every corner you turn you'll have something that catches your eye. The main house at the front of the property is 4 bedroom and is available for bookings too if you have a larger property. ( raglanearthbrickhome ). The bathroom is separate to the shack by the back door. Shower, toilet, and hand basin. Our water comes from our water tanks so please be mindful for not over doing shower time please. Raglan prides itself on recycling so we like our guest to leave the property as they have found it and take their rubbish with them. Raglan recycling centre is only 5 mins away and well worth the trip to explore the shop and score a few scoops, you'll be amazed at what you can buy for $1. We love raglan and are excited to offer our guests a relaxing fun stay leaving refreshed and energised. We live locally and are always available to help with anything. Please contact us first regarding pets. although the property is fully fenced there are a couple low areas if they are jumpers. The main gates close but when main house is booked as well then you'll have to work together. Please leave the shack as you have found it. There is another property on the section available for booking ( 4 bedroom house) which could be booked out as well. we ask to limit the shack to one car per stay but parking out on the road is available. wifi is ok but can be slow at times. Simple kitchen perfect for short stays. BBQ outside too under cover. Relaxing, super cute and not far from Raglan for a sneaky pint. Such a cute place to stay, close to the beach and with some beautiful bush walks near by. Lou was very easy to communicate with and offered to be on hand if we needed. I’m quite tall (6ft) so did find upstairs a little snug around the head when standing but with all the time we spent surfing we hardly noticed! Hoping to get a chance to stay again soon! With my thick hair the low water pressure in the shower was noticeable but most people wouldn’t have a problem. The surf shack is a great location. Short walk to the beach. It was clean and comfortable for our stay. We had a wonderful time at the surf shack however would only stay for a short time as limited cooking facilities . Overall, we had a wonderful stay at the surf shack and the owners were very helpful. Cool spot ! Tidy, clean. Lovely host! Funky shack! great just what we were after for a couple days away from home. Lou provided soap, chocolates, and made the place welcoming and comfortable!